Few villains in the Marvel Pantheon have been quite as iconic as the Kingpin. Always a big and imposing man, with the muscle to back up his threats, Wilson Fisk always has a lack of pity for his foes despite a core of love for his family. Be it Spider-Man or Daredevil, Wilson Fisk has been a constant thorn in the side of heroes since the 1970s. But what is his relationship with the man behind the mask of Daredevil, Matt Murdock? That is what Man Without Fear issue 4 seeks to explore. Written once more by Jed MacKay, he’s joined by artist Paolo Villanelli and colorist Andres Mossa. Clayton Cowles returns as a letterer for the book as well. With Matt Murdock still in the hospital, and refusing to continue his therapy, the last thing he needs is a visit from an old foe. Wilson Fisk takes time out of his daily routine as mayor of New York City to visit him. While Matt pretends to be asleep so as to avoid talking with his foe, Wilson takes the chance to make an issue-long monologue on his relationship with Daredevil. At the same time, an early unseen fight between Daredevil and Kingpin is retold from both ends. But what is the point of Fisk’s visit? To gloat? Or something more sinister? Jed MacKay has been batting a thousand with his issues of Man Without Fear, and this issue is even better than the rest so far. Fisk is in his prime here, cold and intimidating, among some of his best portrayals since Miller back in the 1980s. However, the best has to be the flashback told from both Fisk and Murdock’s points of view. Hearing Fisk brag about beating Daredevil to a pulp, while also hearing how it still haunts Matt’s nightmares is positively chilling. 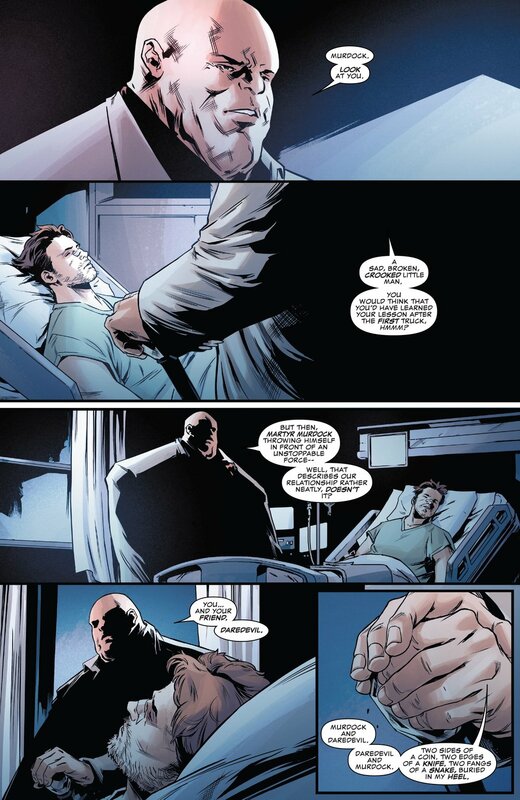 All throughout the story, MacKay teases at what Fisk wants to do, what Fisk may know. The end of the story is nothing short of amazing, teasing at more symbolism to the tale than just Matt’s own sense of fear and fearlessness coming to life. Best known recently for several excellent Star Wars books, Paolo Villanelli brings an excellent cinematic sense to the book. Extreme close-ups and dutch angles are sparingly used to bring a sense of unease, perfect for Matt’s mindscape with Wilson Fisk only inches away. The flashback also has a delightful noir tone to it, albeit with shades of blue and flesh rather than pure black and white. This only serves to make Daredevil’s bright red outfit stand out, cutting a completely different silhouette in the fight sequences. This also lets Fisk blend in with the backgrounds, almost making him feel like one with the city he claims to own; fitting, as Fisk is the one relating the tale and reveling in it. Body language is also excellent, with a few quiet moments being more disturbing than any shouting or punches. With one issue to go, Matt becoming Daredevil again seems a foregone conclusion with Fisk taking an interest in him. Time will tell if MacKay and his katamari of revolving artists can land the final issue. However, it’s hard not to argue it’s been a real treat for Daredevil fans so far.